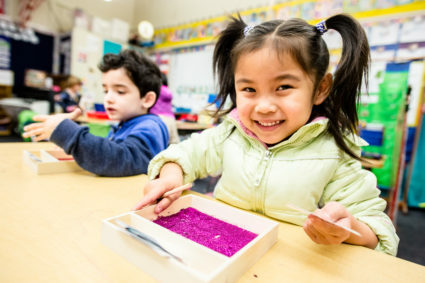 SAN GABRIEL, CA – San Gabriel Unified School District has opened enrollment for its kindergarten and transitional kindergarten programs, providing robust early learning opportunities and preparation for the social and academic rigor of elementary school. Program offerings include a 1:1 student-to-tech device ratio, award-winning music immersion instruction, Spanish dual-language immersion, Leader in Me schoolwide model and STEM curriculum supported by fully equipped labs. Transitional kindergarten, available at McKinley, Roosevelt and Washington elementary schools, introduces children to a structured educational environment and jumpstarts learning with developmentally appropriate curriculum. The daily schedule includes class instruction and activities, small group instruction and independent hands-on learning experiences. Kindergarten programs are offered at all five elementary schools: Coolidge, 421 N. Mission Drive; McKinley, 1425 Manley Drive; Roosevelt, 401 S. Walnut Grove Ave.; Washington, 300 N. San Marino Ave.; and Wilson, 8317 E. Sheffield Road. Children must turn 5 by Sept. 1 to register for kindergarten. For transitional kindergarten, children must turn 5 between Sept. 2 and Dec. 2. Children who turn 5 between Dec. 3 and Jan. 31 will be accepted into transitional kindergarten as space is available. Parents can enroll their children by visiting their local San Gabriel Unified school from 8:30 to 11 a.m. and from 1 to 3 p.m. or by visiting www.sgusd.net. For information about inter-district transfers, call (626) 451-5400. SANGAB_ENROLLMENT: San Gabriel Unified School District’s transitional kindergarten and kindergarten programs jumpstart learning with developmentally appropriate curriculum. Washington Elementary in San Gabriel on Wednesday, Jan. 30, 2019.